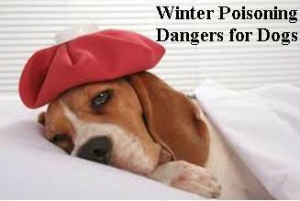 With winter here and snowfall hitting all across the U.S., there are a few very important winter poisoning dangers that all pet owners need to be aware of. The salt that is laid down on roads, sidewalks, and driveways can be a major health risk for our four legged pets. Dogs (and cats) step in salt and naturally want to lick their paws to clean them and relieve the skin irritation. However, this can cause a potentially fatal reaction to the chemicals they are ingesting. Some possible ways to prevent this is by not allowing your dog to walk on the salt, use a pet safe deicer, and wash your dog’s paws off before they get the opportunity to lick them clean. Another major health concern during the winter months is the issue of anti-freeze ingestion. Many vehicles leak anti-freeze on roads and driveways. These puddles can be very appealing to our pets because of the color, odor, and taste…making it a very concerning issue for dog owners. Consumption of anti-freeze can be fatal to dogs and cats if not treated quickly. Possible symptoms of ingestion include: vomiting, seizures, increased rate of breathing, and appearing sleepy. 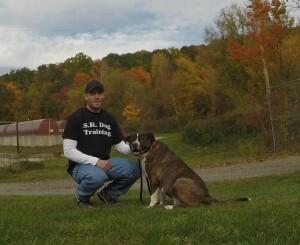 Prevention is often the best way to keep our dogs safe from these very common dangers. However, if you even suspect that your dog might have been exposed/consumed either road salt or anti-freeze, make sure you contact your Veterinarian immediately. Let’s keep our four legged family members safe during this winter season. If your dog is lacking physical exercise because of the inclimate weather, learn How to Play a Structured Game of Tug with Your Dog. By knowing these important winter poisoning dangers for dogs and keeping your pet well-exercised, ensures that your four-legged family member will be happy, healthy, and ready to enjoy Spring!